Image courtesy of LIFT Architects. Material Resonance will be a four-day, intensive workshop focused on practical application of RhinoScripting or Grasshopper. The workshop will train participants in CNC fabrication using MasterCAM and the Washington University DIL fabrication lab. There will also be demos of the new plug-ins Firefly and Kangaroo. 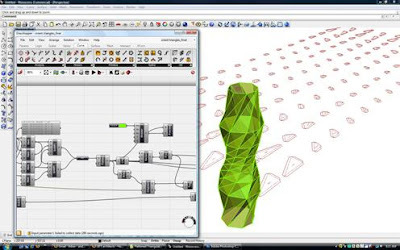 The workshop is for professionals and students with a working knowledge in Rhino. Prior experience with Grasshopper or Rhino VB scripting is not necessary. The workshop will start from first principles and cover topics from tessellation, components, and connections to part organization, nesting, and labeling.